Weldy Walker was an African-American whose professional baseball career is little more than a footnote in baseball’s record book. Of note, however, is his professional and major-league debut with Toledo on July 15, 1884, in an American Association game. When he stepped onto the field that day he became the second black man to play in a major-league contest. He followed his older brother, Moses Fleetwood Walker, who had made the first race-breaking appearance for the same team earlier that same season. Weldy and his brother Fleet spent much of their lives in concert, sharing baseball, education, activism, and business experiences. Weldy (a.k.a. Welday) Wilberforce Walker was born in the eastern Ohio community of Steubenville on July 27, 1860. He was the fourth son and last born of the six or seven children reared by Moses W. Walker and Caroline O’Harra Walker,1 both of whom were of mixed race. The early history of both parents is unclear but by 1870 the family had moved to Steubenville, where Moses W. Walker worked as a cooper. Moses later became one of the first black physicians in Ohio and a minister of the Methodist Episcopal Church. The first record of Weldy’s play appeared after his father’s call in 1877 to serve the Second Methodist Episcopal Church in Oberlin, Ohio. Weldy enrolled in Oberlin College’s Class of 1885. In what would be a familiar theme, he joined brother Fleet on the school’s first varsity inter-collegiate team in 1881. Weldy joined Fleet for a few games with the semipro New Castle Neshannocks late in the summer of 1882 and then followed his sibling to the University of Michigan. There he enrolled in the homeopathic medical school. He pursued his degree for two seasons and played baseball during the springs of 1883 and 1884. He left school without completing his medical studies. Weldy next turned up in 1884 in Toledo, where Fleet was employed as the regular catcher on the otherwise all-white entry in the American Association, a major league at the time. Fleet was among several disabled Toledos when the Toledo Evening Bee reported on the July 15 game against Philadelphia: “To fill out the nine, the Toledos secured the services of Weldy Walker, the brother of the Toledo catcher, who is visiting here, and put him in left field.”2 The younger Walker performed well and drove in two runs when he sent “the ball down among the daisies in left field for two bags. …”3 His Toledo and major-league career lasted but four games and he and Fleet were never in the lineup together. The local press made no mention of his color. As Weldy established himself in the hospitality business, he also became an activist in racial issues. About the time of his involvement in the Mingo restaurant, Weldy and a black friend attempted to integrate a Steubenville roller rink. They were refused admittance. They then sued and were awarded damages.7 He would continue to raise his voice for this cause for the remainder of his life. Steubenville, O., March 5[, 1888]. – Mr. McDermott President Tri-State League. – Sir: I take the liberty of addressing you because noticing in THE SPORTING LIFE that the “law permitting colored men to sign was repealed, etc.” at the special meeting held at Columbus, Feb. 22, of the above-named League of which you are the president. I concluded to drop you a few lines for the purpose of ascertaining the reason of such an action. It is not because I was reserved and have been denied making my bread and butter with some club that I speak; but it is in hopes that the action taken at your last meeting will be called up for reconsideration at your next. The law is a disgrace to the present age, and reflects very much upon the intelligence of your last meeting, and casts derision at the laws of Ohio – the voice of the people – that say all men are equal. I would suggest that your honorable body, in case that black law is not repealed, pass one making it criminal for a colored man or woman to be found in a ball ground. There is now the same accommodation made for the colored patron of the game as the white, and the same provision and dispensation is made of the money of them both that finds its way into the coffers of the various clubs. When Weldy’s brother Fleet played for Toledo against Chicago in an exhibition, it may have marked the beginning of the end of African-American participation in Organized Baseball. The game of August 10, 1883, played in spite of the protest of Chicago manager Cap Anson, certainly brought the issue of racially integrated baseball to the forefront and began an open, blatant, and successful effort to bar black players. This letter by Weldy came near the end of baseball’s first integrated era. Ironically, he was caught up in the end of the process that his brother may have started in Toledo five years previously. In 1897 Weldy opened an oyster and fish store in Steubenville14 and beginning at about the start of the 20th century he settled into his life’s work at Steubenville’s Union Hotel, where he was proprietor and/or manager for more than two decades.15 He lived at the Union Hotel with his nephew Thomas. During Prohibition years he worked as a bootlegger,16 not his first involvement in an illegal activity. He had been indicted previously by a Steubenville grand jury for keeping a gambling house.17 Weldy remained with Thomas in the hotel until his death, caused by influenza,18 on November 23, 1937, at age 78. Never married, Weldy Wilberforce Walker was buried in Steubenville’s Union Cemetery. The author relied heavily on David Zang’s definitive biography of Moses Fleetwood, Fleet Walker’s Divided Heart. The work well-researched, well-documented and well-written and contains many references of Weldy Wilberforce Walker. Chalk, Ocania, Pioneers of Black Sport (New York:Dodd, Mead & Company, 1975). Lin Weber, Ralph Elliott, ed., The Toledo Baseball Guide of the Mud Hens 1883-1943 (Rossford, Ohio: Baseball Research Bureau, 1944). Zang, David W., Fleet Walker's Divided Heart: The Life of Baseball's First Black Major Leaguer (Lincoln: University of Nebraska Press, 1995). Hurd, Jay, SABR BioProject, "Sol White"
1 Though Weldy Walker was reared by Caroline O’Harra Walker, there is some question of his maternity as his death certificate denotes his mother as Maria Simpson. 2 Toledo Evening Bee, July 16, 1884, 4. 4 David W. Zang, Fleet Walker's Divided Heart: The Life of Baseball's First Black Major Leaguer, 45. 6 Cleveland Gazette, August 21, 1886, 2. 8 Jay Hurd, SABR BioProject, Sol White, sabr.org/bioproj/person/2f9d1227. 9 Cleveland Gazette, June 2, 1888, 1. 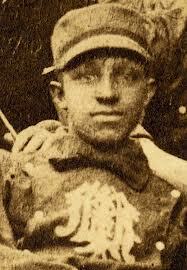 10 The author’s research reveals that Weldy Walker played four games for Toledo 1884. References indicate five games played. The difference is most probably due to crediting the game of August 6, 1884, in which Fleet Walker played center field for Toledo to Weldy Walker. Correcting the error diminishes Weldy’s short career but raises his batting average from .222 to .286 and removes the two errors charged to him. 11 Cleveland Gazette, October 30, 1897, 1. 13 Sporting Life March 14, 1888, 5. 14 Cleveland Gazette, December 18, 1897, 1. 17 Wheeling Register, January 17, 1887, 3.